Have you seen this fun game? It is perfect for those fall festivals you have coming up! This game is a mix of some of your favorite games. A mix of Bocce, Bowling, and on the ground darts makes for an interesting game and great way to get off the couch as a family! I think that this would be a great way to have people play for a grand prize at a Fall Festival! Works in a gym and in the grass for whatever weather you have on your Festival day! A house should be full of love so why not express it on the walls. 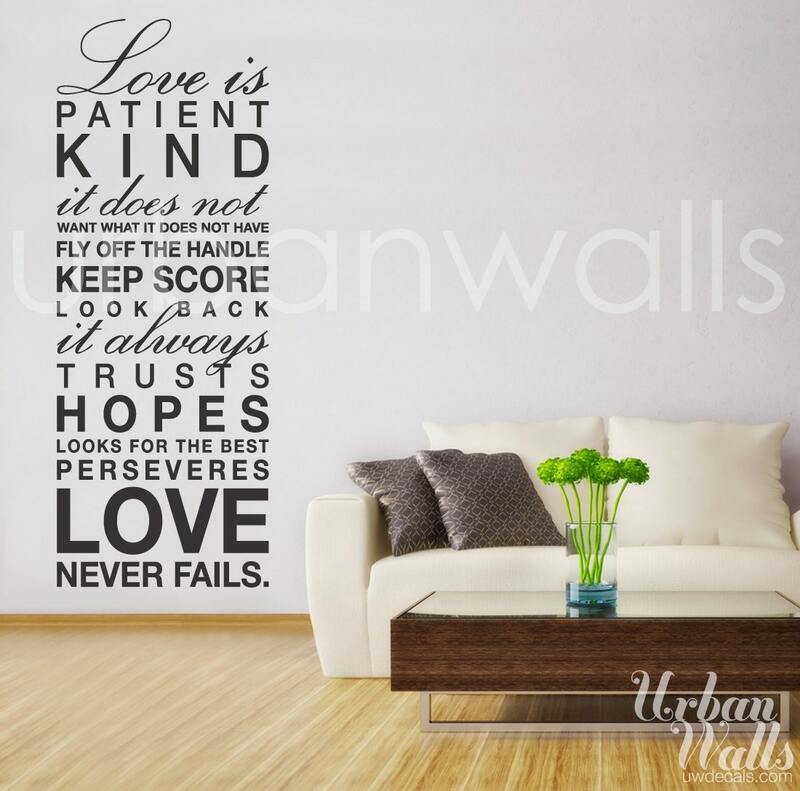 The definition of love is a great message to help the house remember during hard times during good times, that is is full of love. I personally love the new wall decal trend in decorating and have put up decals in both my kids room so now it was time to think about the rest of the house. So, I headed over to Urban Walls to check out what they had. We drove out of Scotia Canyon and decided that our last vacation fun would be to visit a local vineyard I had read about. It is the Sonoita Vineyard and I wanted to go there because it was started, ran, and owned by a scientist! I have always wondered if someone who focused on the science would be able to create a better wine than those who go by taste and hand down knowledge. Mediflow Waterbase Pillow Review & Giveaway-Do you need a better night sleep? Why not check out a pillowy solution with this giveaway and review! We packed up the car and headed out home. Before we were to get home we had planned one last hike. We drove through the base and over to Scotia Canyon. After what seemed like forever we finally crossed where the stream would have crossed the road had it been there and the camping parking was immediately to our left. How well is my well-being? I'm a mom and like most of you, I'm not always at the top of the do something fun list. When was the last time you sat down and thought about "My Well-Being"? Exactly, chances are you are neglecting something. For the sake of our families, I think, it's good to check in with yourself once and a while. A little re-evaluation to the care you are giving yourself can result in better care for your family. Running a daycare means having to balance an afternoon snack without destroying the kid's appetite for dinner. It's one that I'm conscious of as a parent with a picky eater. If I let her overload with a favorite snack full meals are even harder to get her to eat! Always on the look out I was excited to test out a natural product perfect for snacks! iPad3 Giveaway Blogger Sign Ups! Attention all sane bloggers! Sign up for this Free event! Your readers will probably hate you if you don't because the prize is an iPad3! I'm signing up for my readers right now! 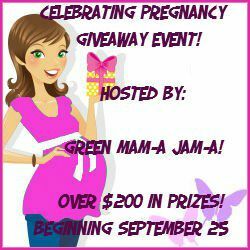 Welcome to the Celebrating Pregnancy Giveaway event, hosted by Green Mam-a Jam-a! Mommy Moments with Abby is very excited to help her preggie mama's out by offering them the chance to win this giveaway! Check out this giveaway! Weddings are expensive. We are hoping to help you out, plus help you keep your amazing bouquet in tack with this Hand Made Fabric Toss Bouquet Giveaway Sign ups! If you think/know your readers love saving, but don't want to miss out on a bit of elegance then sign on up for this giveaway. One winner will receive a Hand Made Fabric Toss Bouquet in the colors of their choice. Even better is this is a FREE blogger event, all you have to do is post and promote! Mom Does Reviews and It’s Free at last for the Ultimate Camera Bag Giveaway! Mommy Moments with Abby is joining in on the fun for her readers and you should too! We knew that the area of Ash Canyon had been hit hard by the fire and that their were no reported sightings of the Lucifer at their normal haunt, Mary Jo's. Still, we just had to stop and see if maybe we would be the lucky first to spot this rare hummingbird. Celebrating Pregnancy Giveaway Event Blogger Sign Up! I'm not sure what was in the water 9 months ago but I know 4 people who are pregnant or just had a baby! Because of all that I love offering giveaways to my readers who are pregnant or know someone who is pregnant. I know my readers will love these prizes and I bet your will too! Sign up it's free! We drove up Carr Canyon, but due to road conditions had to stop and turn around as the 4 door sedan isn't made for terrain that rocky. We decided to go back down and park near Carr Canyon House. We sadly noticed that none of the feeders were out. We walked past and headed down a trail. It started sprinkling on and off. Mom's we all know we start thinking about Christmas way in advance in order to cut costs and to save our sanity when shopping with kids! Lucky for us, Kmart's prepping for the season of giving by launching the “Big Layaway Giveaway”. What is the Kmart's Big Layaway Giveaway you ask? It means there is one layaway giveaway per store per week every week from 9/9/12 through 11/17/12! This means a ton of chances to win those holiday gifts you plan on giving this year! That means that now's the time to place those gifts you've been eyeing on layaway and also get the chance to win some great prizes at Kmart! Cake Plate Giveaway Blogger Sign Ups! Do you know a bride to be or someone that just loves baking? Do your readers? This is a great giveaway! The winner get's one handmade Cake Plate from Suzy Q's Vintage Shop! The giveaway will run for a month and starts on 9/24/2012. Sign up to offer this amazing giveaway to your readers and you can enter to win as well! After stopping for lunch in our room, we headed to Target to grab a few things and make sure we were in cell rang when the birding group called. We weren't disappointed as they called with instructions on where to go. We arrived shortly after them and were warmly accepted into their group. The home was beautiful and that of a nature photographer whose yard wasn't only a bird paradise but hosts over 77 species of crickets!!!! From the San Pedro House we headed to Sierra Vista EOP. We were hoping for more activity here and wanted a photo of the Yellow-Headed Black Bird. We sat for a while and saw some Yellow-Headed Black Birds, but they didn't cooperate for a photo. Alright Mom's! Kids are in school everyone is back on schedule, the clothes bags and supplies have been bought, time to think of you! Time for a new handbag! Check this one out and enter to win one! I don't know about you but other than my wallet everything in my purse or mom-bag is for the kids. It is so annoying when our special visitor comes each month and I need some space in my bag that won't destroy my little package so I can use it when the time comes, I usually end up pulling out a crumpled mess or already dismantled item which does not help when your having one of those have to move quick and deal with this because the kids are ready for lunch and I still have to make it through the line moments! Red Solo Cup! I lift you up! And have a Review and Giveaway?! That's right! My bloggy friend is having an awesome Red Cup Living Giveaway and was kind enough to share her thoughts with us on the products themselves. Oh these aren't just cups, but products perfect for that tail-gating event you've been thinking about planning. Check this out and enter to win some for your football event! Find beauty in the Fall wherever you live! I live in Arizona and what many don't know is that the fall is when you plant for the spring! But what about the fall colors? I think people often forget the beauty that the fall can hold with all the colors swirling about. A little Fall gardening can help with that. Miracle-Gro is sharing fun, simple, and achievable projects for Fall gardens to show they can still be beautiful. From Beatty's we headed to San Pedro House. We had heard and seen a fly by of the Coot yesterday, but greedily wanted a photo of this rare bird. We started off and excitedly headed to San Pedro House on July 10, 2012. What was in the water 9 months ago? I feel like everyone I know is pregnant or has just had a baby! I can't keep up with all the baby gifts! I feel like I constantly run out of cute stuff to get people for their little ones! I hate giving the same gift to people, so it's a dilemma! For those of you with Ipods or Ipads who are travelling abroad this year it may be a good idea to get an app for that! The language that is, you can study and study, but when in an actual usage situation with native speakers finding the right terms can be tricky. Our minds only work so fast when recalling facts and facts which we haven't frequently use can take longer to recall. Do you really want to be trying to order a meal and have it take 5 minutes just to remember how to order a salad risking annoying your waitstaff(we all know what can potentially happen then!!!)? Check out this fun review of an app just for this issue! After our long hike the night before we decided to head back to Beatty's early in the morning to see if we could spot the White-Eared Hummingbird again! This time we parked at the right spot. We sat down on the bleachers and our first visitor of the day was an Anna's Hummingbird. What mom doesn't love sitting in the tub with candles lite and a good book? How about knowing your handle holds an even better surprise? I love the idea of the added anticipation checking after each bath to see if your prize is revealed. Honestly, if I got one of these I'd probably end up loosing it and digging the jewelry out! Instead, I'm excited to offer the chance for you to win one! Check it out! I am the Voice of Hyland's Giveaway! "I am the Voice of Hyland’s” Giveaway! Celebrating the newest Brand to Mommy Moments with Abby! I am now a Brand Ambassador for Hyland Products! I love these and not only use them myself, but have recommended them and had parents of children who attend my daycare use them. Check out this amazing Giveaway to stock your shelves for the Cold Season that is approaching! We arrived back where we were staying and we walked over to the Ramsey Canyon Preserve to check out what they had to offer. We were very pleased at the friendly staff and that they showed us exactly where a Violet-Crowned Hummingbird's nest was seen. With our new knowledge we headed on the trail. Glass Handbag Blogger Giveaway Sign-ups! Mommy Moments with Abby just hates to miss out on a bag giveaway! I think my readers would hate it too, so I signed up! Blogger Opp to help spread the word for Red Cup Living. This is perfect for Football Season or fall festivals! Mommy Moments with Abby would love your help with this! All Bloggers will get one free Facebook link and one free Twitter link. All I ask in return is that you help promote the sign up sheet on any social network or your blog AND promote the giveaway as much as possible. I know how busy a bloggers life can be between raising a family, jobs, blogging, promoting, and whatever else that comes up. All sign ups should be submitted no later than September 10th. Thanks! I love introducing the kids to different sounds and musical styles. So, in the search of new sounds I accepted the chance to check out Astrograss's newest CD! Check out my thoughts on The Colored Pencil Factory! I've been in the pool a lot lately, trying to add some extra weight loss before the wedding in December. This means my hair has been getting dryer and dryer. Made from Earth asked me to review their conditioner and I figured it couldn't hurt! So, my husband is always asking me why my feet are always cracking. Well, we live in Arizona and I don't wear socks and shoes a lot since it's so hot and I run a daycare, flip flops are easier to get on and off when you are dealing with a bunch of kids. The dry heat does murder on my feet, plus swimming in the pool a lot adds to the damage. It may not have helped that my feet swell to epic proportions when I'm pregnant and leave my skin in not the best shape postpartum. When I got the chance to test out Toe Juice I decided it was definitely a product I could run through the ringer. I'm an admitted shoe hoarder! My biggest weakness, adorable heels! Can you feel me on this one ladies? My biggest issue is that heels are so uncomfortable, can you feel me on that one? So, after watching my husband get amazing relief from his specially made orthopedics, I decided that maybe this was an answer for me. Only issue is I can't afford to go and get a few hundred dollar orthopedics specially made, especially when its to relieve the pain from heels not caused by years of crushing my feet from power lifting like the hubby had. Dilemma, hmmm, solution! Kids grow too fast! I'm always having to go through their closets and take out what doesn't fit and move up the larger sizes or go shopping for more to cover their little bodies so I don't have a bunch of naked kids running around the house. So, what do you do with the clothes they have out grown? Right now, I'm trying to save them with the hopes of more kids one day. My issue is that once the next kid gets here I'm going to end up with a ton of storage bins that will be waiting for when the new kid out grows the clothes. I hate storing empty boxes that I could use in the time being for something else. So, what is a girl to do? From the San Pedro House we headed to the Holy Trinity Monastery in David, AZ. When we first pulled in we were greeted by an unusual, but amazing sight. Male Peacocks were wondering about!